At this time of year Britain is teeming with summer berries, but some varieties have fallen out of favour. We look at the five forgotten summer berries you should get cooking with. The sight of summer berries creeping into our hedgerows is a bittersweet affair. On the one hand it marks the start of a season in which even urbanites are persuaded to don a pair of fingerless gloves and dip into nature’s bounty. On the other, it’s a premature warning that autumn is on its way; Mother Nature’s equivalent to the person that says, “Ooh, the nights are drawing in now” when it’s still only bloody August! Nonetheless, I don’t know of anyone that does not benefit from a ritualistic picking of blackberries at least once a year, especially when it results in a heart-warmingly tasty crumble. But to take just blackberries from a season in which many other berries also bloom seems a real waste. Here is a guide to five forgotten berries that come into season over the summer months. I like to think gooseberries have a taste to match their current fortunes: sour. Because while strawberries, raspberries and blackberries are still widely enjoyed, gooseberries have rather fallen down the pecking order in recent times. One suspects this is largely because they are wincingly sour - particularly early season. But in the right context - as a counter to mackerel or duck, perhaps – its biggest flaw becomes its biggest strength. It soars in desserts – use in a posset, fool, ice cream or, as immortalised in Simon Armitage’s gooseberry season poem, to make a zippy sorbet. For more advanced options, try macerating gooseberries in a white spirit like gin or vodka to deepen their flavour. One of the best desserts I have ever had was at The Star Inn, Harome, where Andrew Pern garlanded a rice pudding with gin-macerated gooseberries. Season: Earlier than most berries: from June to August. Appearance: Slightly plumper and rounder than green grapes with a veiny skin. Redcurrants actually belong to the same family as gooseberries and share their sharp flavour. You will need to sweeten with a little sugar before eating one raw. As gooseberries have found a loving partner in mackerel, redcurrants share the same attachment to grouse – a prime example of Mother Nature playing matchmaker. Yet they could also work alongside most other gamey meats, such as duck, venison and pigeon. Their bright red appearance often determines that they are used for decoration, but to do so would be to grossly undersell them. A high pectin content means they are well suited to converting into jam, while the fruit also lends itself well to many desserts, vinaigrettes and sauces. 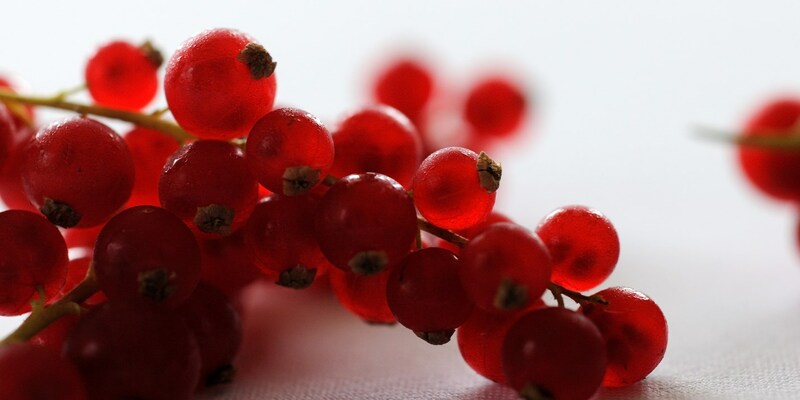 Appearance: Small, plump red berries. Wimberry, Whortleberry, Bilberry, Blaeberry - the many names this bluey/black fruit goes by harks back to a time when many regions in Britain had their own title for this once popular and indigenous berry. Its falling popularity can be explained by two interlinked reasons: a fungal plague (referred to as ‘Bilberry blight’) that has decimated many crops around the country, and the emergence of blueberries to take its place. Think of the wimberry as the red squirrel of the berry world - perfectly adequate but increasingly fazed out by its more durable North American cousin. But it does have its uses. Aside from being incredibly tasty, this wonder berry has been used by soldiers to improve night-vision and is thought to aid gout, skin infections and many other ailments. Wimberries can be enjoyed raw or cooked – and make a worthy contender for pies, jam and even salads. Or, do as the French prefer and serve in a crêpe. Season: Late summer - early autumn. Appearance: Waxy exterior and similar in shape (but smaller) to a blueberry. Colour-wise, lies in the intersection of a purple, blue and black Venn diagram. Once the elderflower season is over, it is not long before the Elder tree begins to flourish with purple/black berries. Easy to spot and relatively abundant, they are often sadly overlooked in favour of blackberries – which ripen at a similar time and thrive in similar terrains. They have a whole host of culinary uses – top chef Paul Foster likes to sweet-pickle them and serve alongside game or oily fish, while they can also be used for making jellies, liqueurs and syrups. Elderberries are very high in Vitamin C and can be just the pick-me-up for the common cold or flu. Season: Very late summer to mid autumn. Appearance: Small, round black/purple berries that grow in clusters. Blackcurrant’s benefits are well documented – touted as a remedy for everything from MRSA to muscle fatigue, it was the original superfood and grows naturally in Britain, too. So why aren’t chefs using it? Perhaps it is because of its associations with sugary drinks, or maybe it is just at the low point of an ingredient’s natural cycle of popularity. Whatever the answer, it is time the humble blackcurrant made a comeback – try serving it alongside game this autumn. Appearance: Intensely purple and 1cm diameter.